I'm sorry for the delay in posting this set. Unforeseen RL setbacks, forum drama, and lack of motivation are to blame. 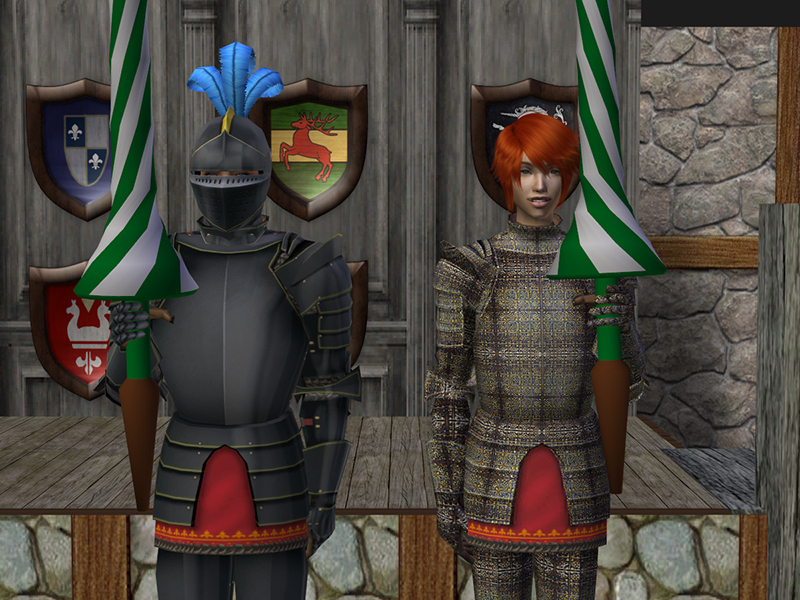 This is a set of 56 meshes and 70 recolors. 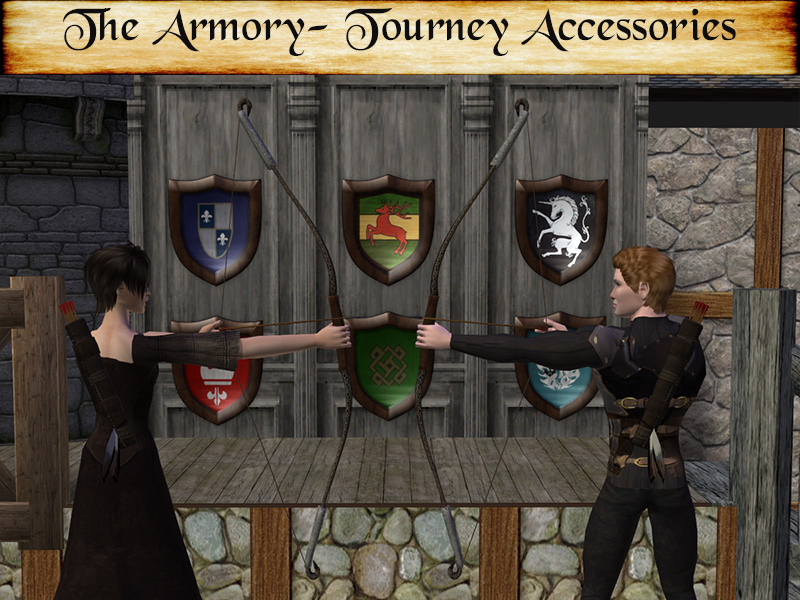 It's designed to be a complete set of accessories for tourneys and competitions. 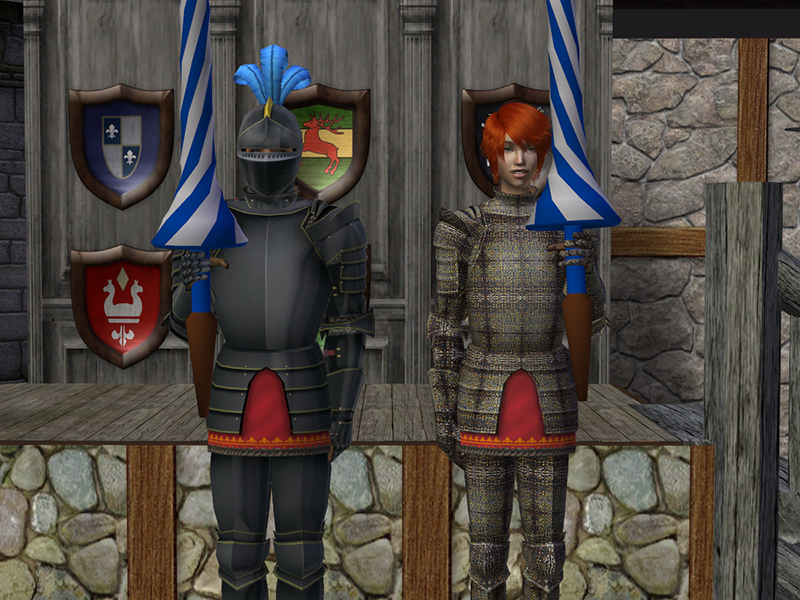 These accessories were designed to be used specifically with the Tourney Poses, but I suppose that they could be used with other projects as well. Because both the poses and accessories have a lot of pictures, I'm posting them separately. 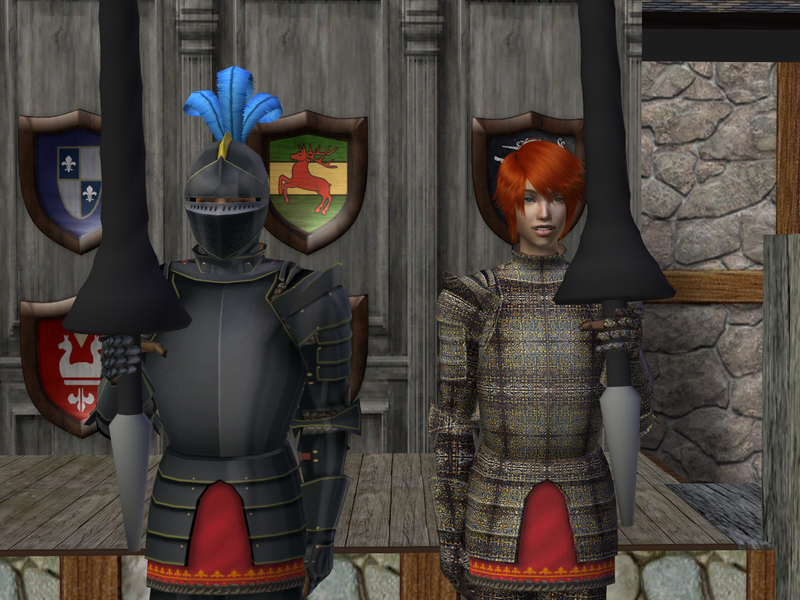 Specifically, all the accessories can be used by teen or adult, both genders, and right- or left-handed Sims (with the exception of the "BB" version accessories, which fit YM-EM only). 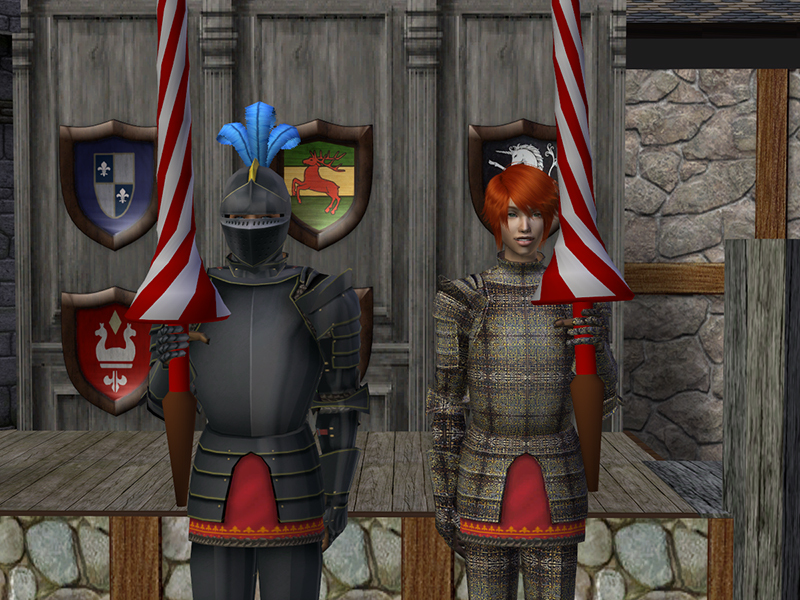 The lance can be carried in the right or left hand and comes with eight recolors. 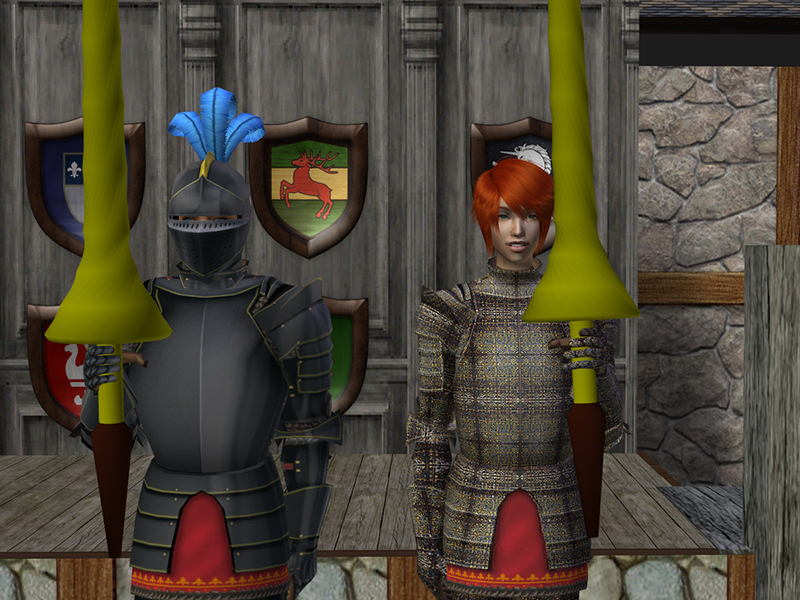 The training shields are intended to be used with NixNivis's practice swords, and has three recolors. 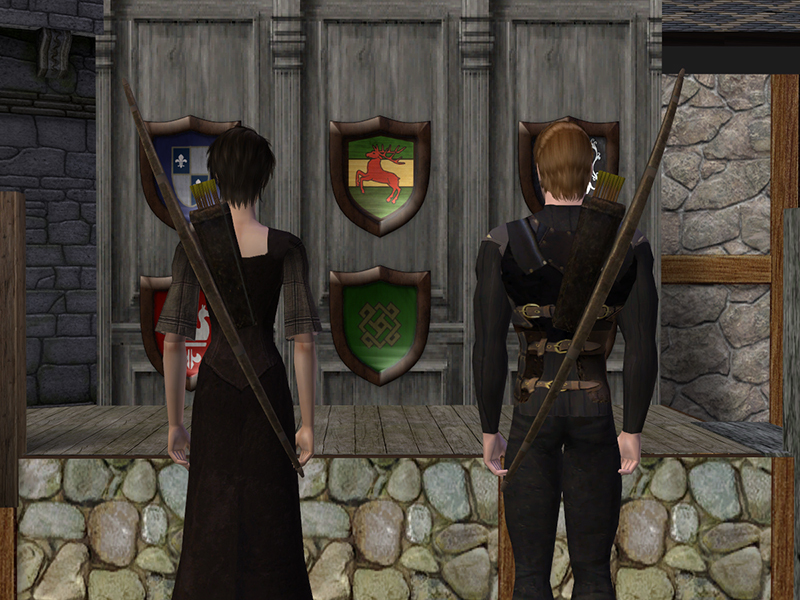 There are four bows, each coordinated with a quiver. 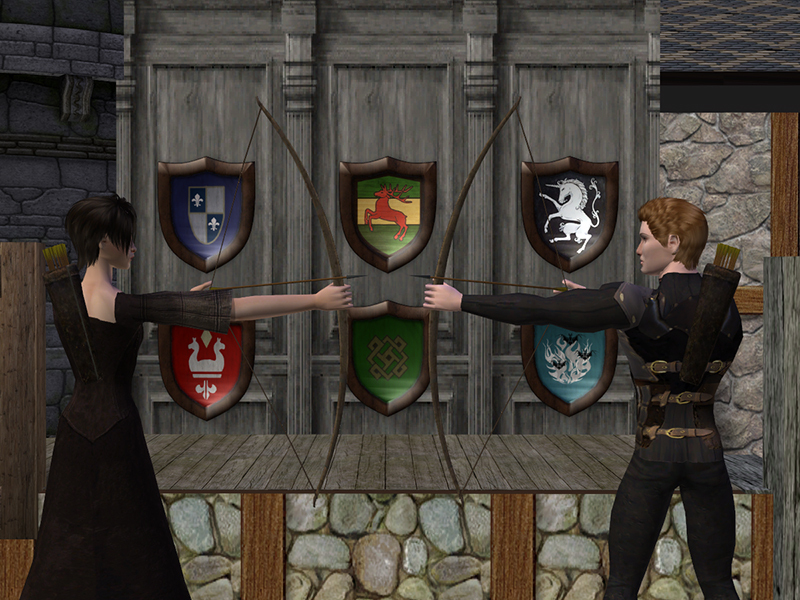 Each bow can be carried in the right or left hand, and has nocked and un-nocked recolors. 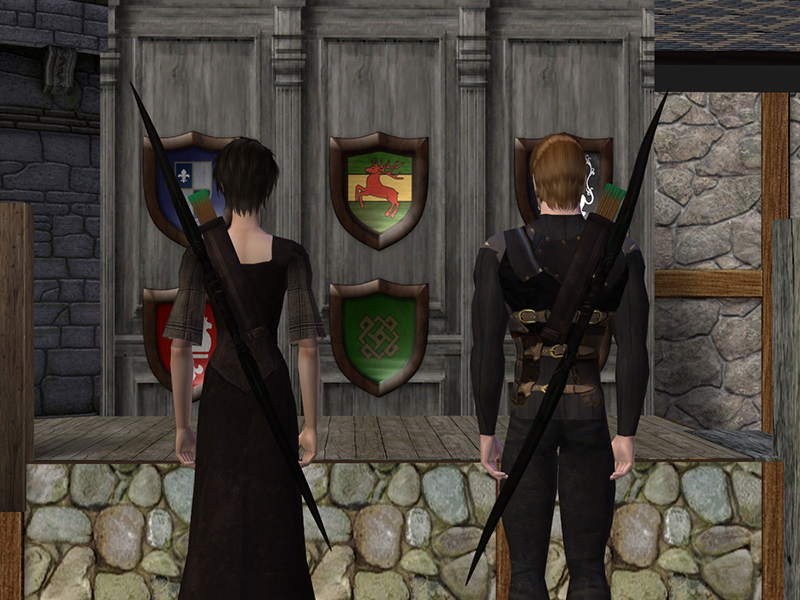 The bows can also be placed, unstrung, over the left or right shoulder for marches and field carry. 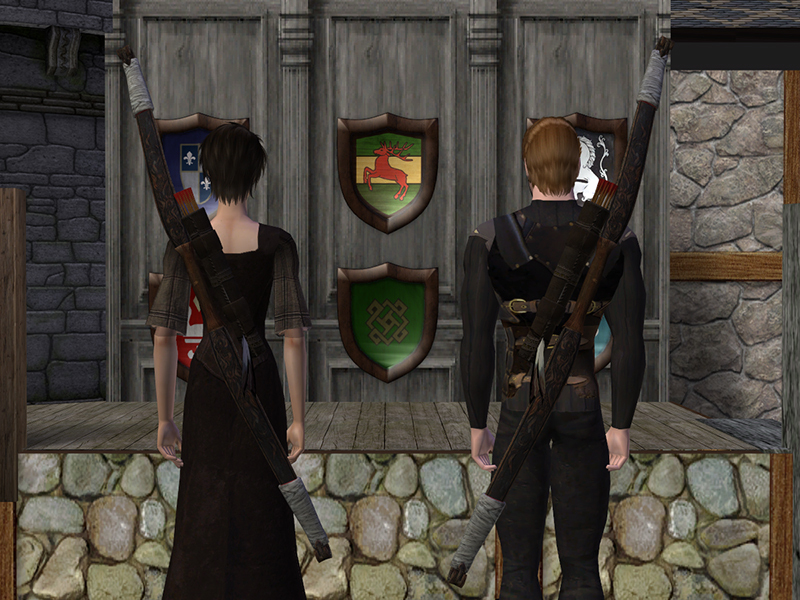 Each quiver can be placed on the right or left shoulder. As a bonus, each accessory comes with a custom Body Shop thumbnail and clearly marked tooltip for easy identification. 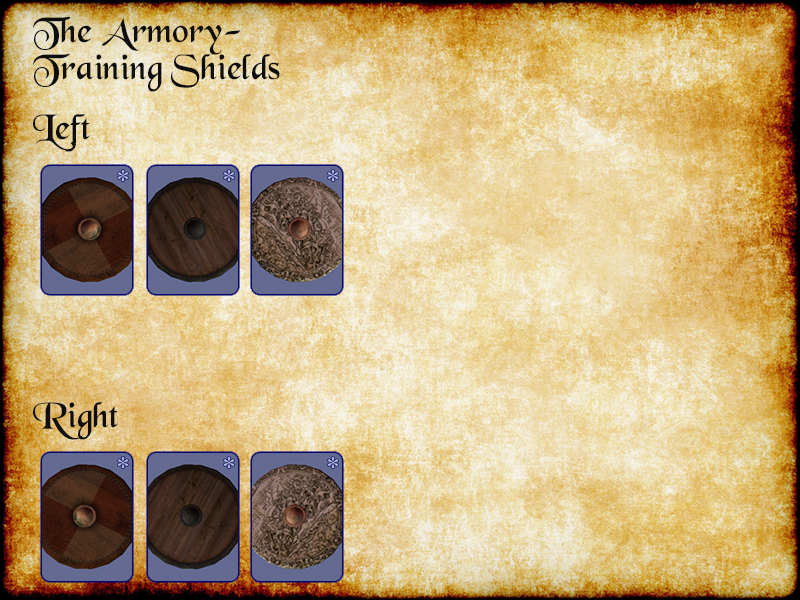 The accessory is a direct conversion of Eva's Viking Shields (the small one). The straps were taken from SynapticSim's Captain America 2.0. 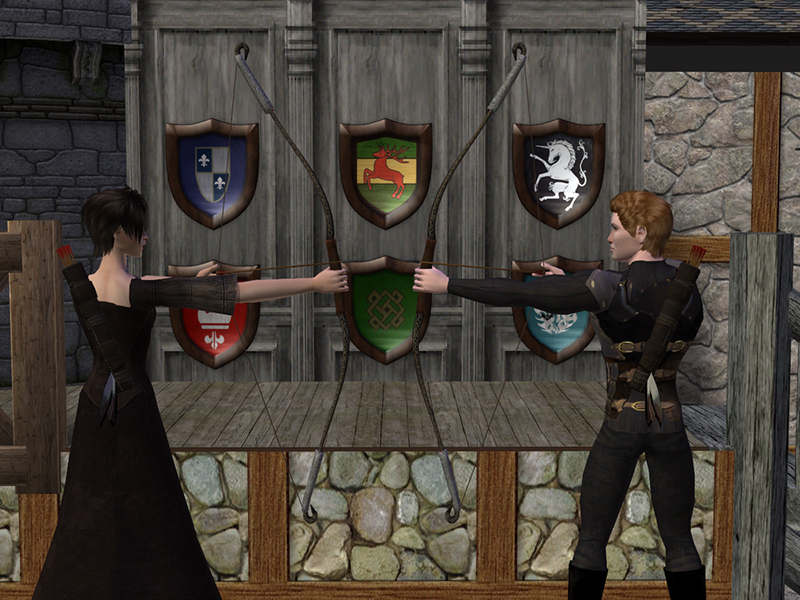 The longbow mesh and texture are by 3dgenerator. The hunter's bow mesh and texture are by x-n-a. 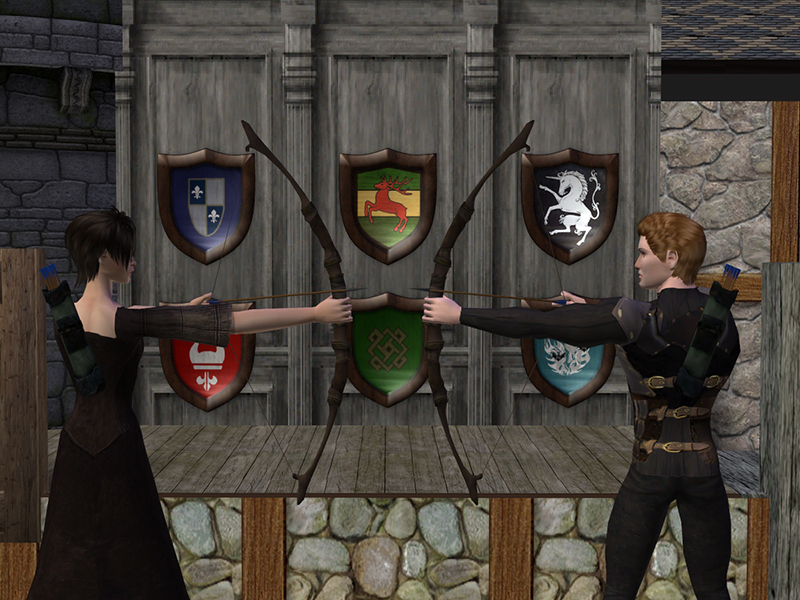 The shortbow and leather quiver mesh and texture are by 3dgenerator. 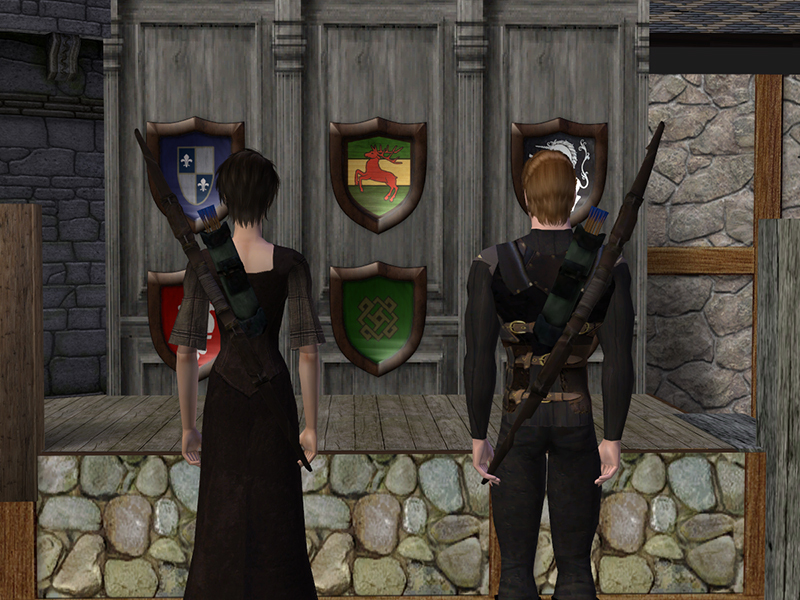 The simple bow, rugged quiver, and hardened quiver were converted from Skyrim by Lady Lochlane. 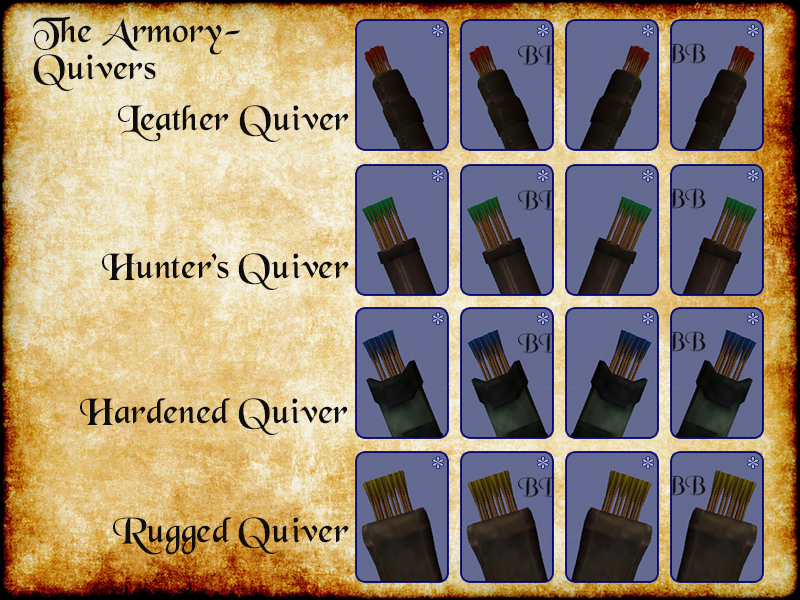 The hunter's quiver is by 3dgenerator. 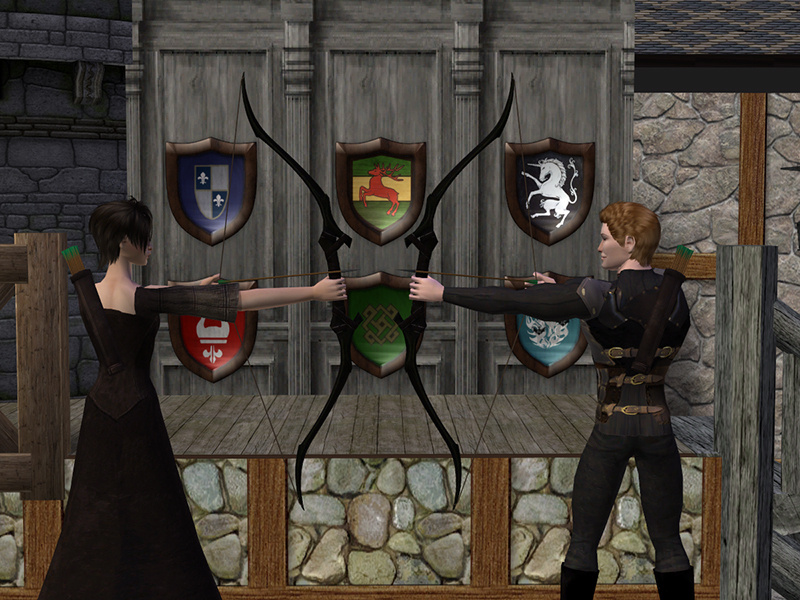 The arrows mesh used in the bows and quivers is by SynapticSim. 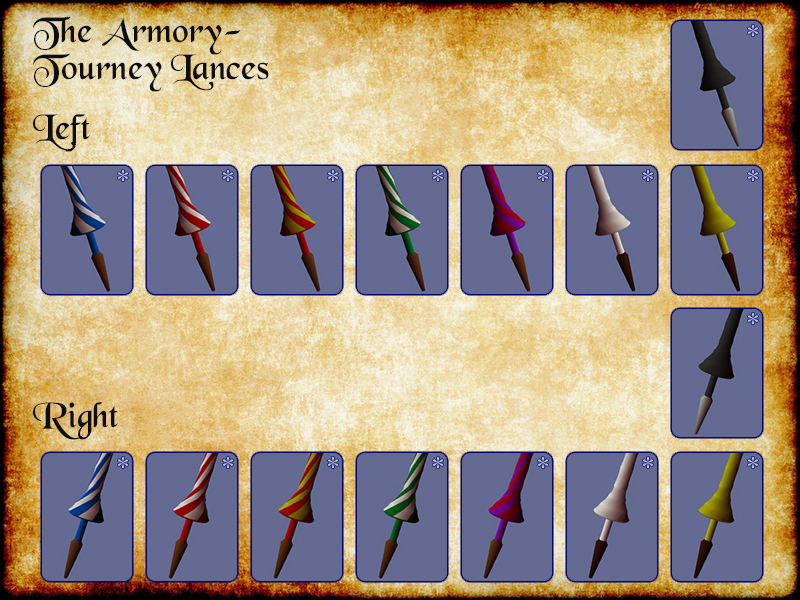 Here are the bows and coordinated quivers in game. 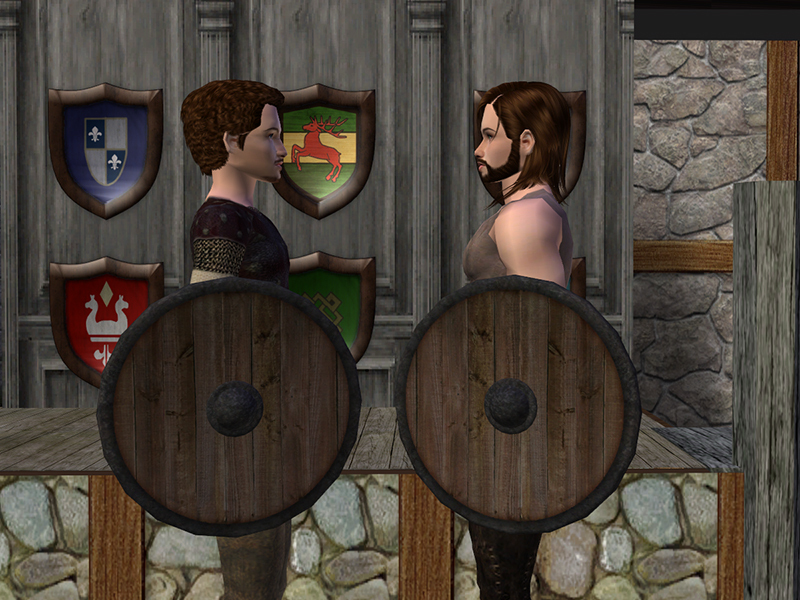 The male sim is using the "BB" version. The bows pictured are in the nocked state. 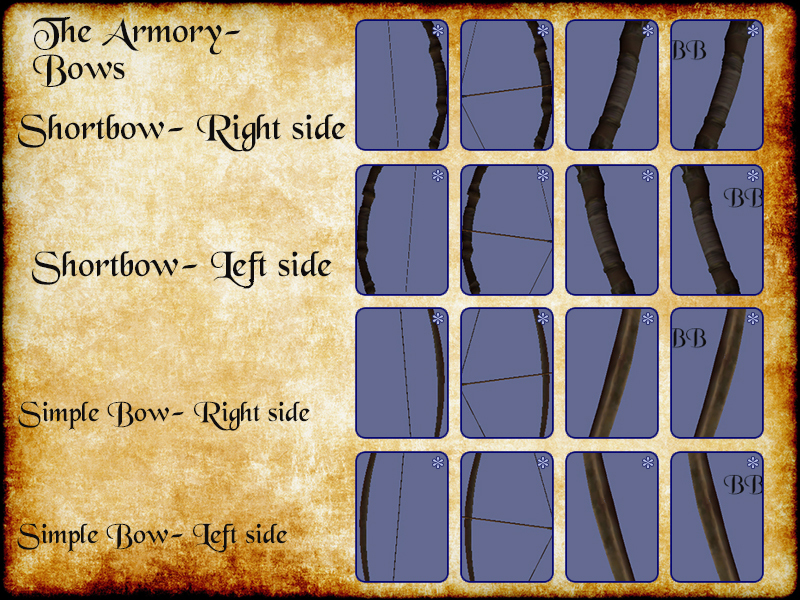 For carrying the bow around, etc., the un-nocked bow can be selected. 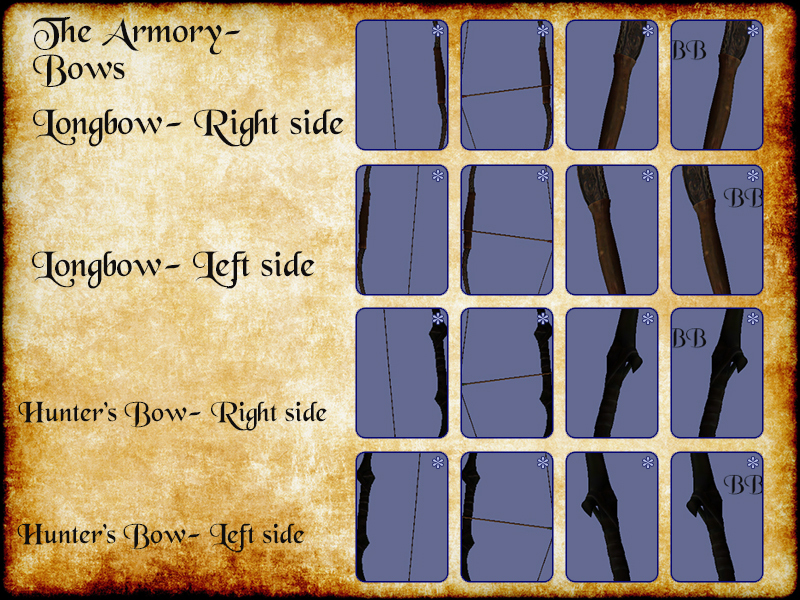 And finally, these are the bow accessories for the back in game, with the coordinated quivers. 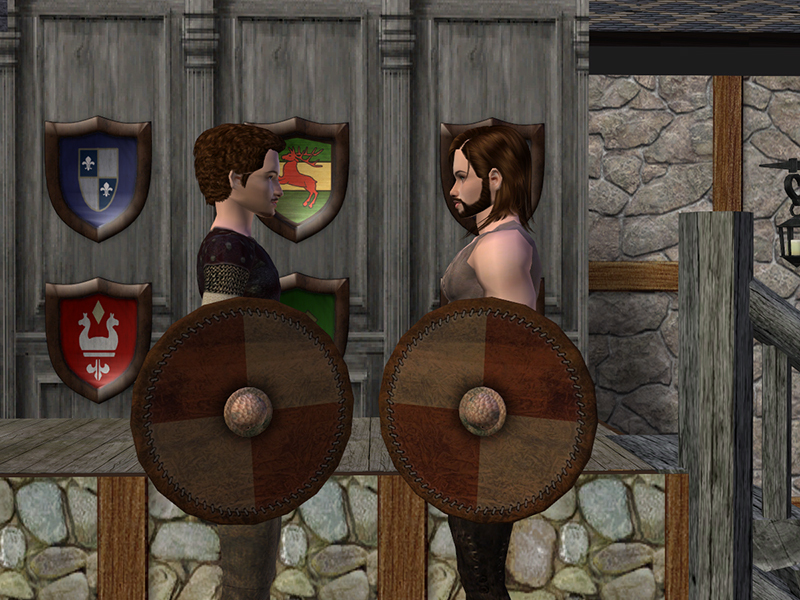 The male sim is using the "BB" version of each. 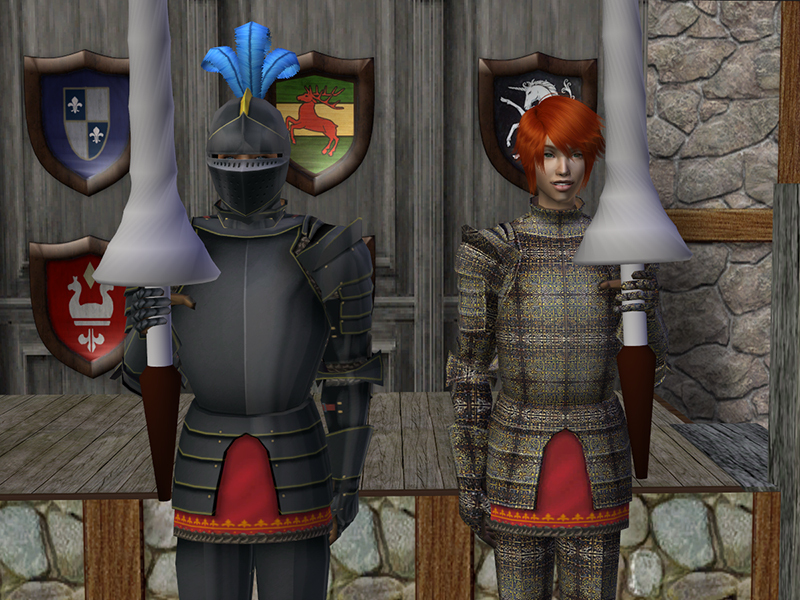 I love that you've got these equipt for either arm! Thank you so much! Hey, there. Why break a great tradition? 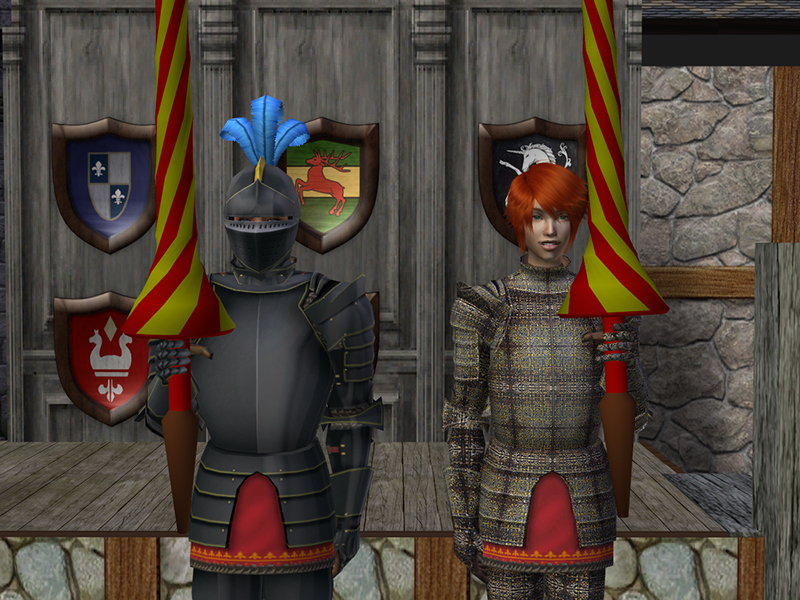 Nix did her original swords in left and right (IRL she's a southpaw) and I did the scabbards that way, to match what was already done. Seemed like a good idea, and flipping the mesh in Milkshape is actually really easy. 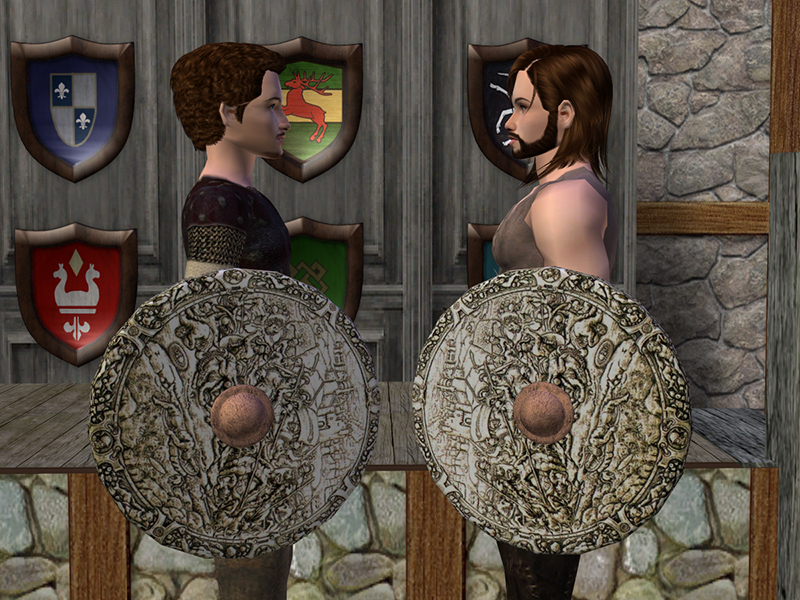 If I ever motivate to do the shields, greatswords, and so on, I'll probably do them that way, too. I'm glad you like them. 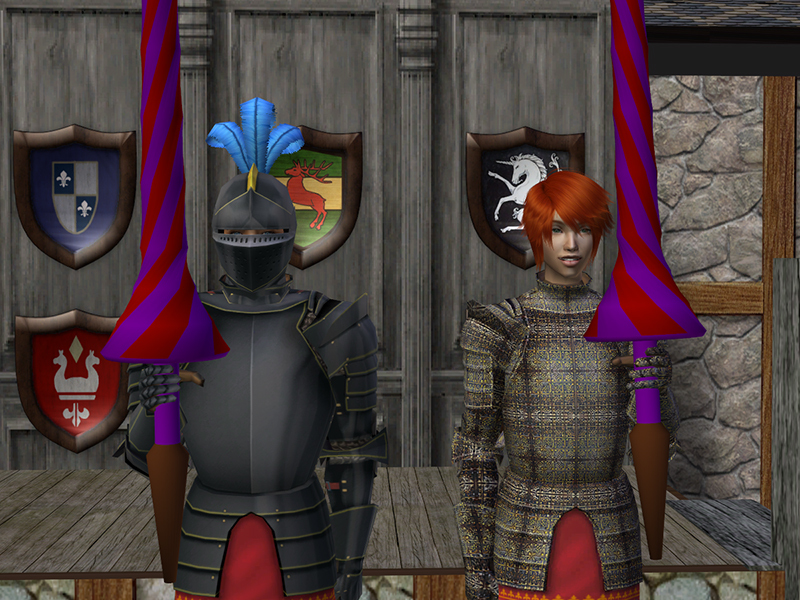 There are never enough weapons for the game. Thank you, Jason. You're welcome. Hopefully there will be more weapons soon. Enjoy!